Heading toward the end of summer when not many things are blooming whether because of high temperature, humidity, pouring rain or drought, there are still some diehard flowers that never disappoint me. 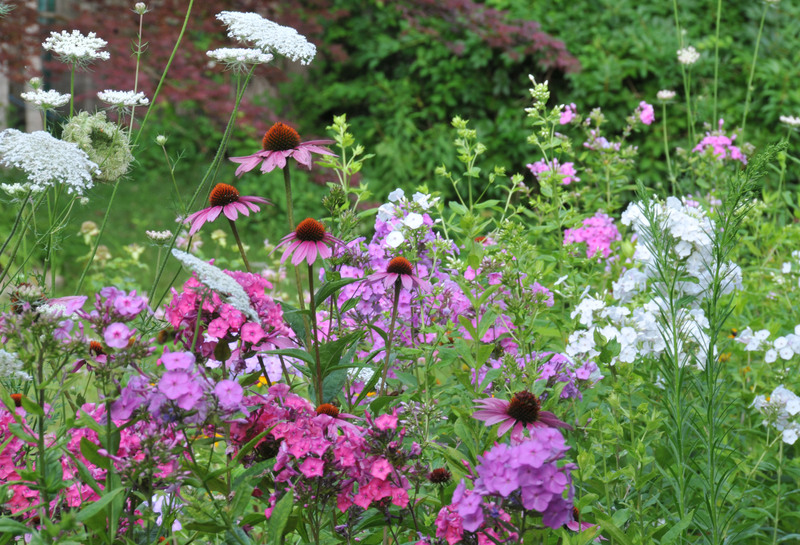 Garden Phlox, Black-eyed Susan, Echinacea and Alyssum just to name a few. 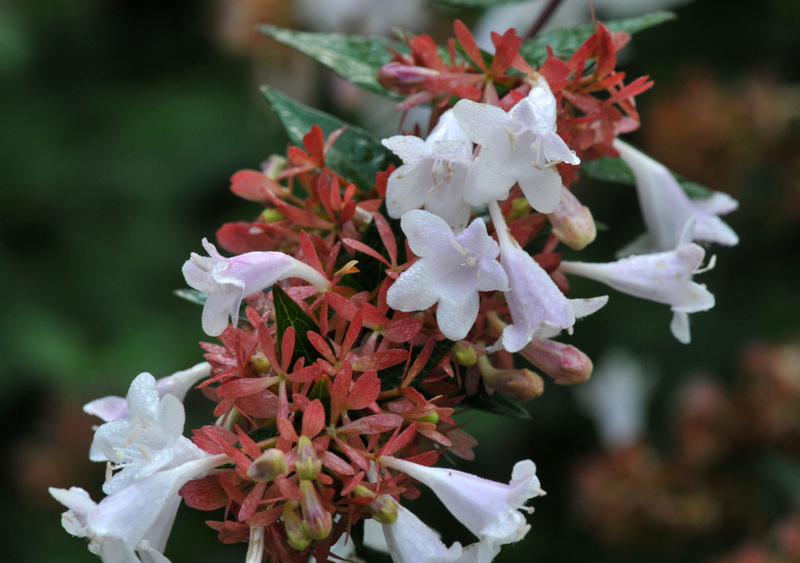 There are also some low growing shrubs and lovely weeds, yes weeds – that is what they are categorized. I do let some weeds like Queen Anne’s lace and Goldenrod grow. 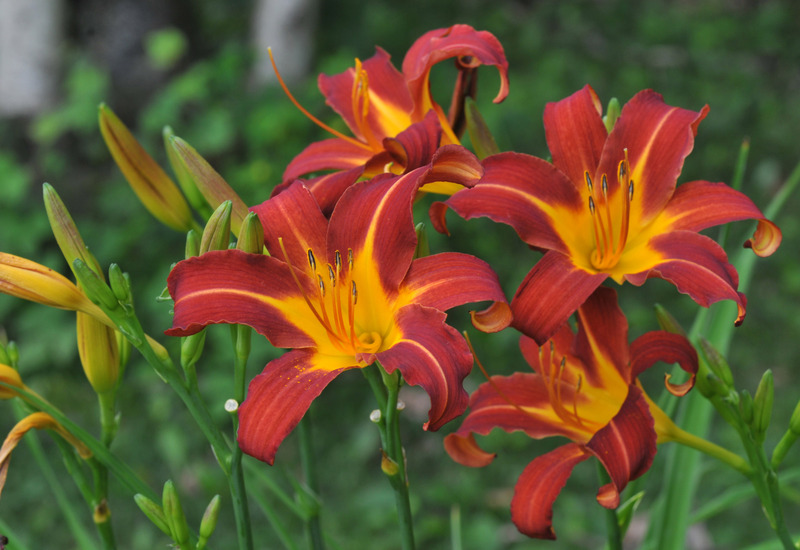 Not just because they are pretty but because my honey bees love them. 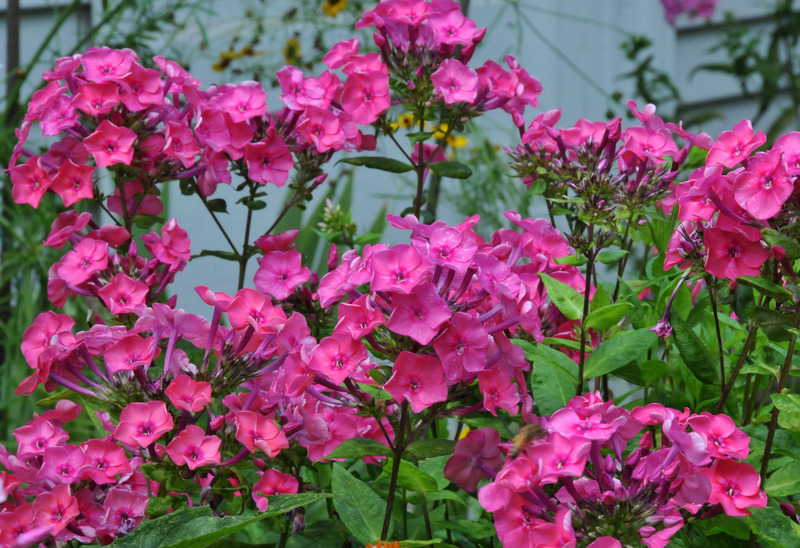 When I first grew Garden Phlox (Phlox paniculata) years ago, I started with a couple of pink colored plants which are the most common. Then added white ‘David’ and an orange whose name I no longer remember. I let insects work their magic and now there is quite a large range of colors. 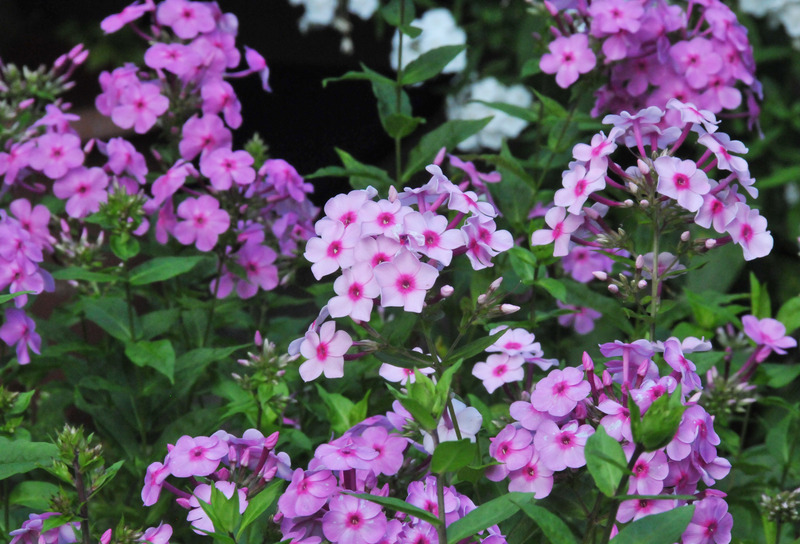 I also realized that growing one or two Garden Phlox won’t do much in terms of fragrance. I couldn’t smell anything if I didn’t put my nose next to it. Now it’s another story. 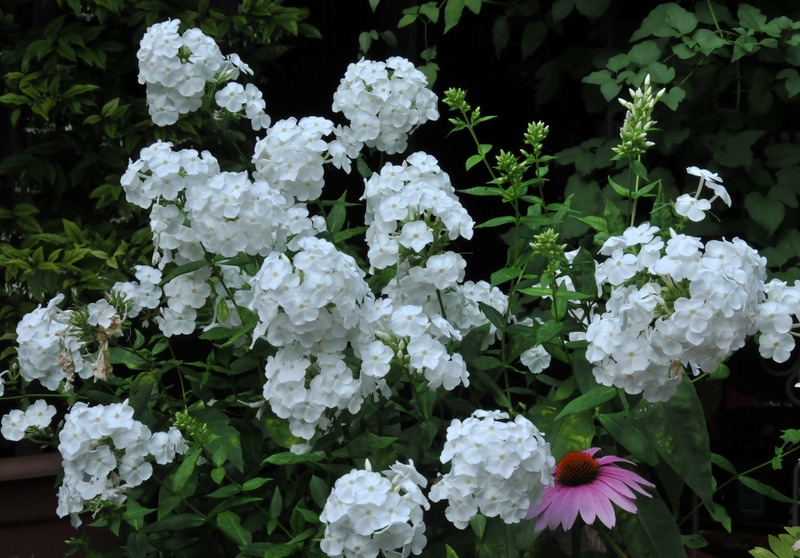 The whole garden is perfumed with a very subtle, soothing scent, which is more pronounced in the cool morning and evening air. 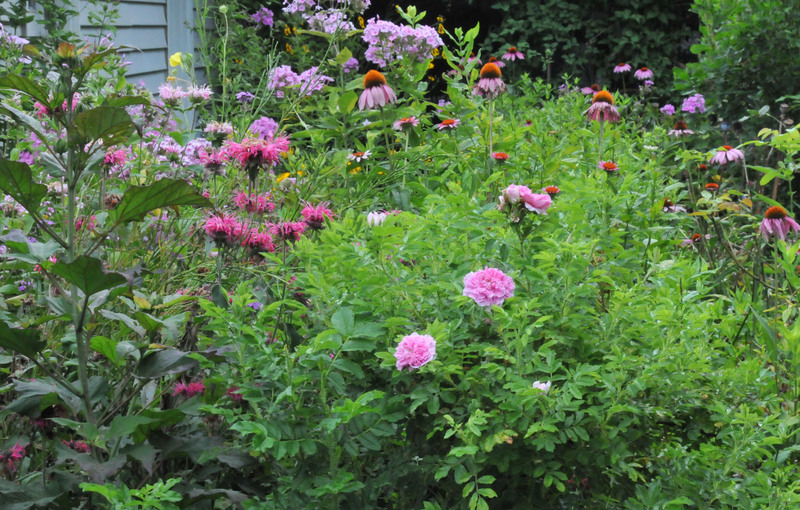 Next spring will be time to weed it down a bit since the plot is getting too crowded. I tie a ribbon to the ones I plan to keep with a map of colors as a guide. The duplicates will have to go. I don’t know if there are any more colors out there but I still keep an eye out for them. 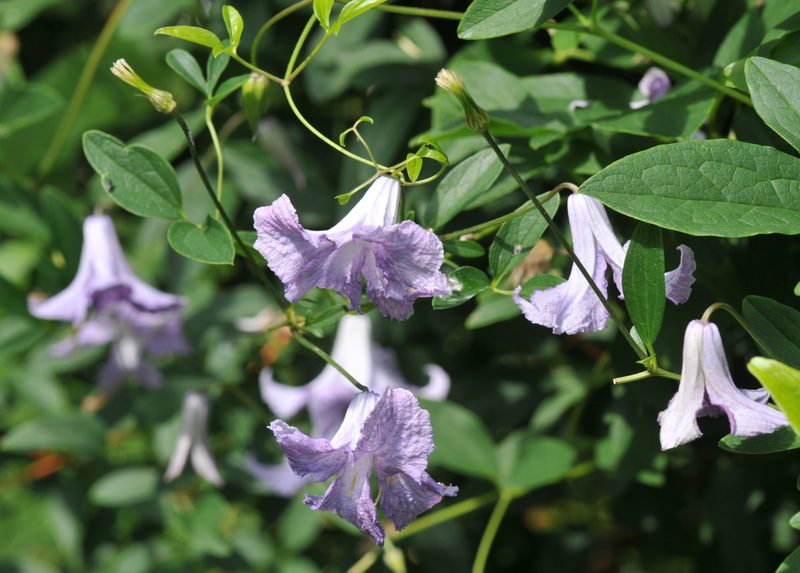 Another flower that started to bloom in June and still blooms now is the Clematis ‘Betty Corning’. In order to induce the vine to produce new flowers I cut the spent flowers off. It has been a very meditative thing to do since there are so many of them but the result is worth it. 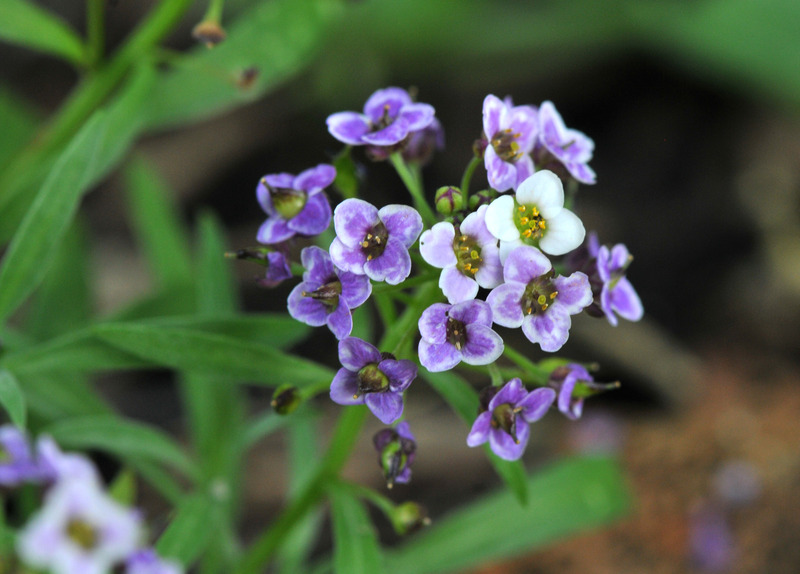 I also have Alyssum growing all over the place in both white ‘Carpet of Snow’ and purple ‘Royal Carpet’. Their fragrance smells like honey and they draw in beneficial insects as well. 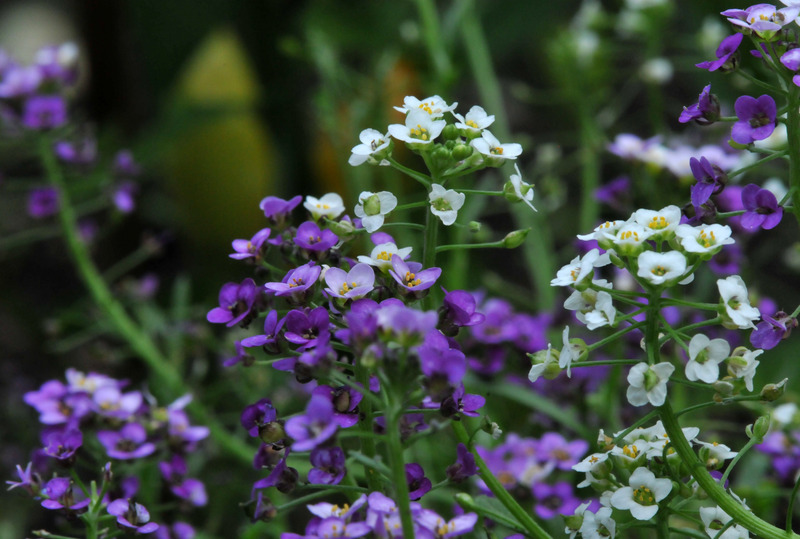 These Alyssum will last until frost. I let them set seed so they will come back year after year. 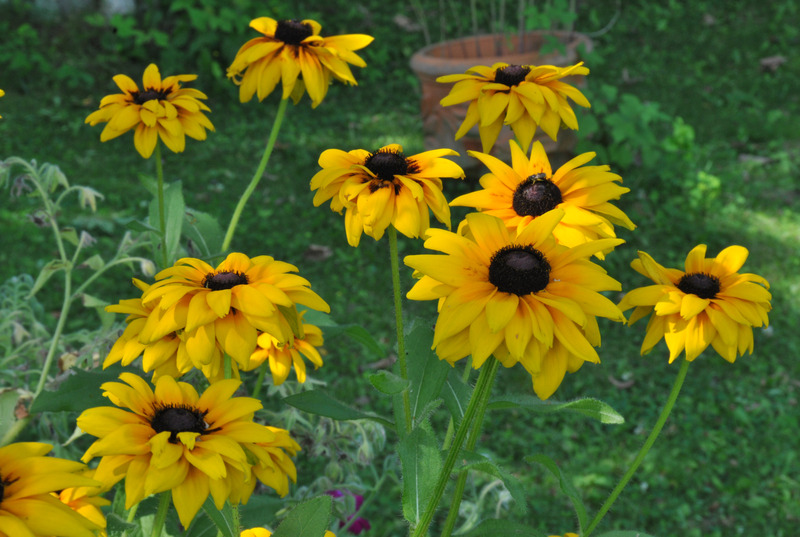 I’ve blogged enough about Black-eyed Susan and Echinacea so I won’t mention them again here but my appreciation for their hardiness and their ‘never fail’ ability to provide colors in the garden is always there. 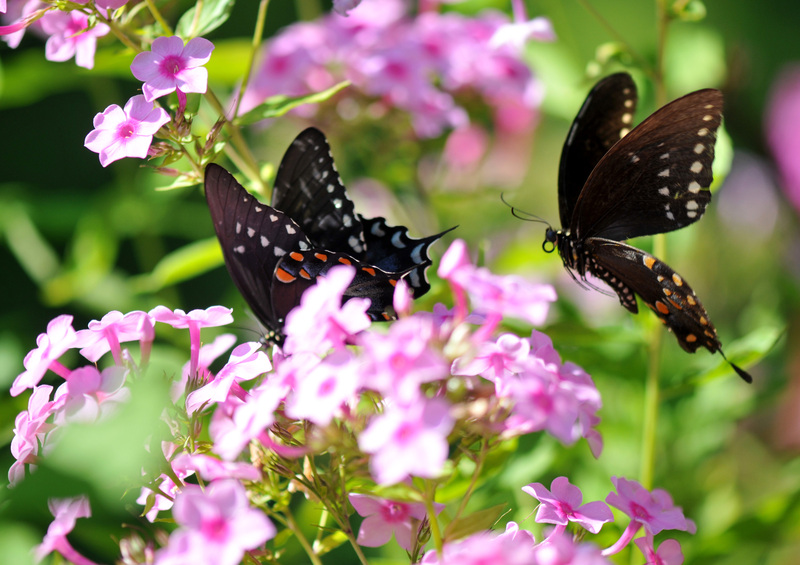 Some butterflies have shown up at last. Not as many as I would like to see though. 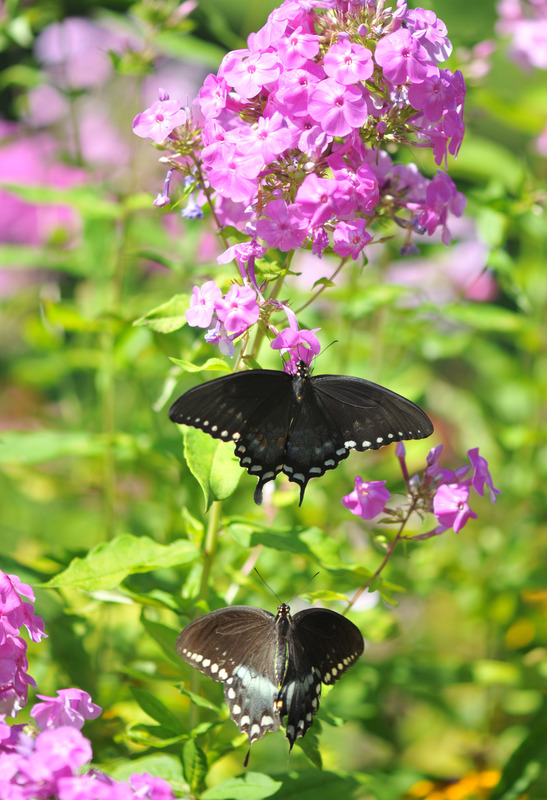 There were dozens of Eastern Tiger Swallowtails in past years, but only two or three of them this year. I’ve seen some Swallowtail caterpillars but they disappeared a couple of days after. I think the birds have been doing their job too well. A team of Gray Catbirds, House Wrens, Song Sparrows, Robins, Eastern Bluebirds, Titmouse, and Chickadees work non-stop on eliminating insects in the garden. I’ve seen one Monarch briefly this summer before it’s also disappeared. 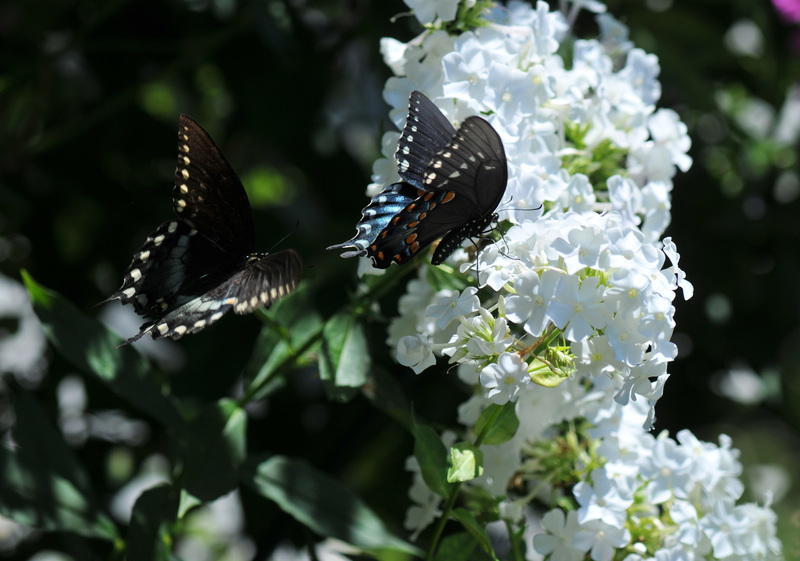 I had some luck a couple of days ago, two Spicebush Swallowtails (Papilio troilus) took their time in courtship, slipping from flower to flower. Wherever the female flew to, the male followed close behind. It’s reminded me of the courtship ritual in many period films….very graceful. The heat and humidity are here. In mid-summer heat I do my garden chores from shade to shade, trying to stay away from the sun. The lovely times in the garden in mid summer are the morning and early evening. 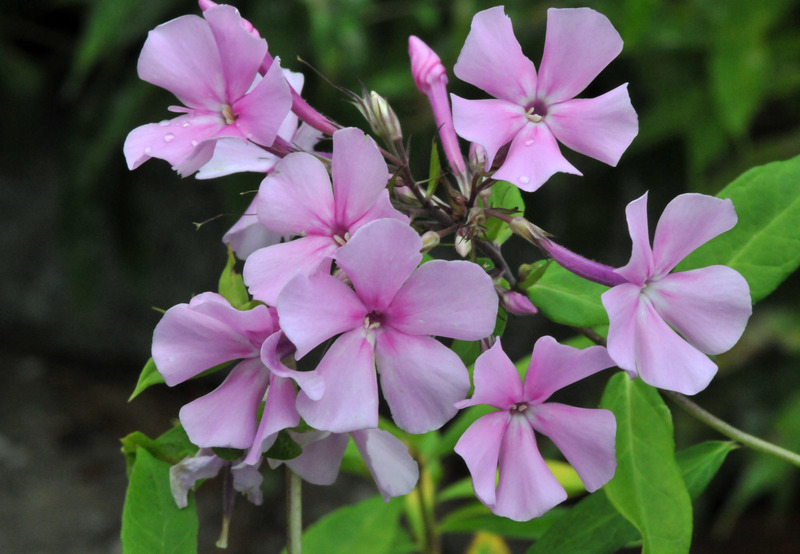 The cool of the morning makes the mixed flower scents very pronounced, especially the Garden phlox and jasmine. It’s very soothing. I water the vegetable garden and the potted tropical plants every morning when it’s still cool. Water evaporates less and will dry up in the sunlight soon enough as not to encourage any disease. 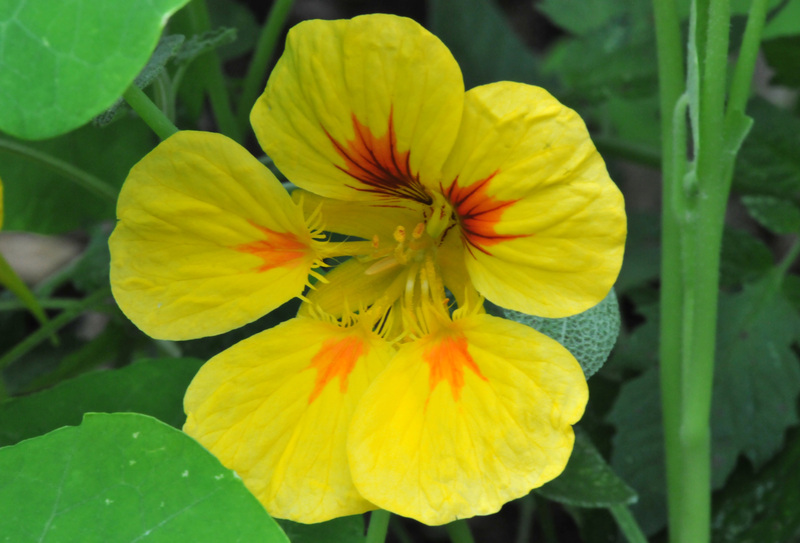 The sweet scent of Bitter melon fills the vegetable garden air now. 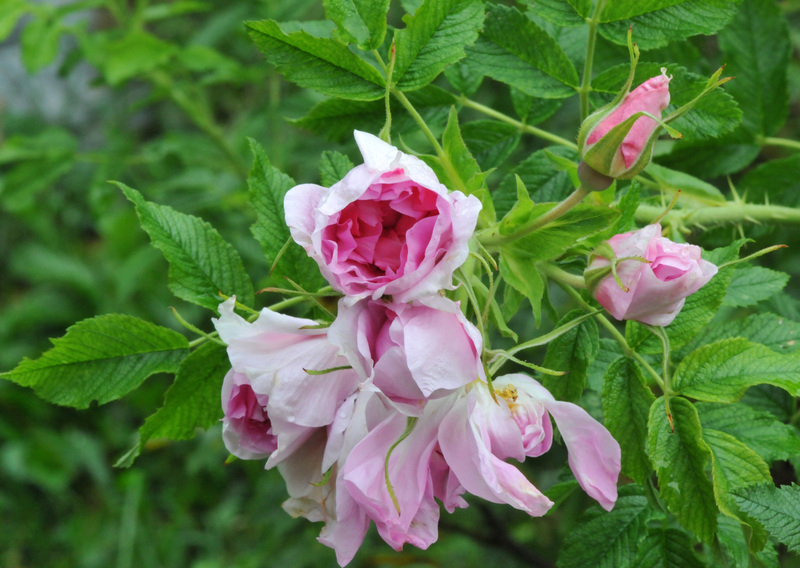 The second flush of roses also adds fragrance to the air though not as strong as in early summer when the majority of bushes were filled with flowers. Even when I don’t have to water them, I still go out in the garden every morning just to breathe the scent that no perfumery can duplicate. I do the same in the evening when I get home from work. I hardly water the flowers in the garden now but they are still doing well in the heat. Most of them are self-sown and I let them grow freely. Once in a while I either move or thin some of them to prevent diseases due to over-crowding. 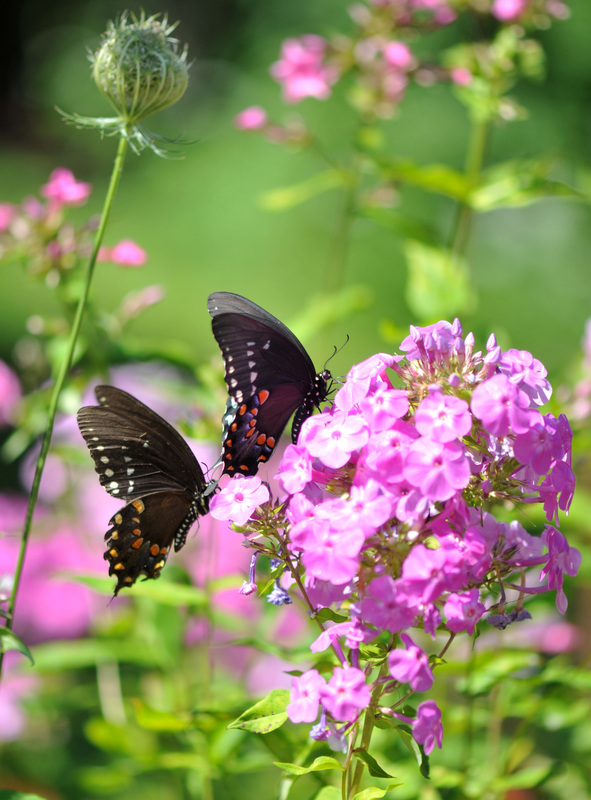 The plants posted below are care free, self-reliant, great for pollinators and dependable in bringing colors to the garden in the heat of summer. 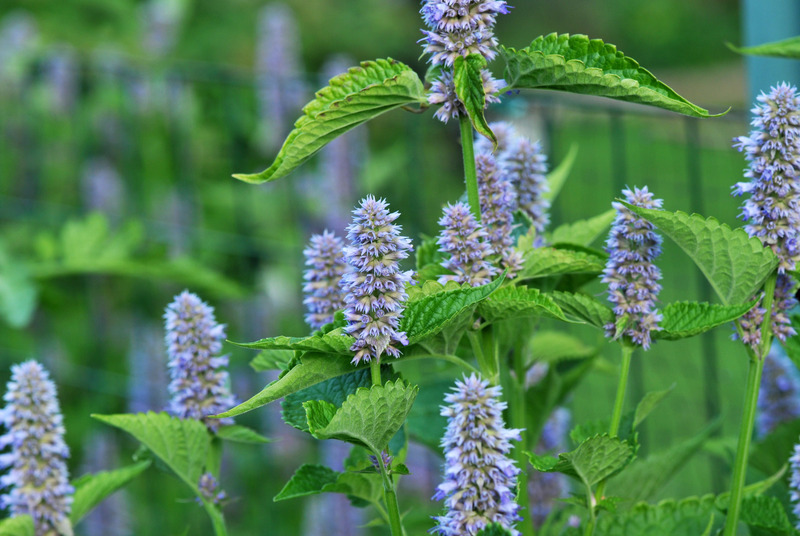 Anise hyssop (Agastache foeniculum) is actually an herb. I grow this for the bees but it’s also good for making tea and potpourri as well. I have a few patches of them, two by the vegetable garden entrance that a send out licorice scent every time I brush against them. 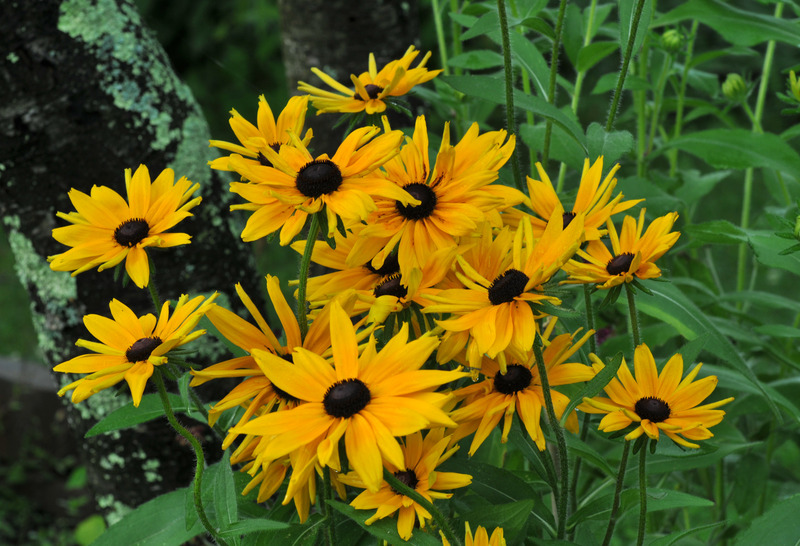 This double Black-eyed Susan (Rudbeckia) is a product of open pollination. I’ve never bought any double flower version but I let the seedlings grow and this is the result. 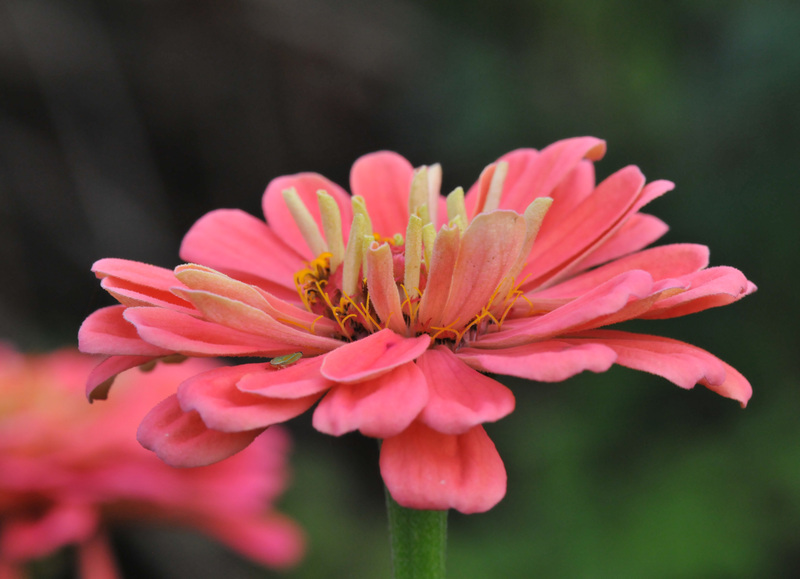 Some of them look even more like chrysanthemums with smaller petals. 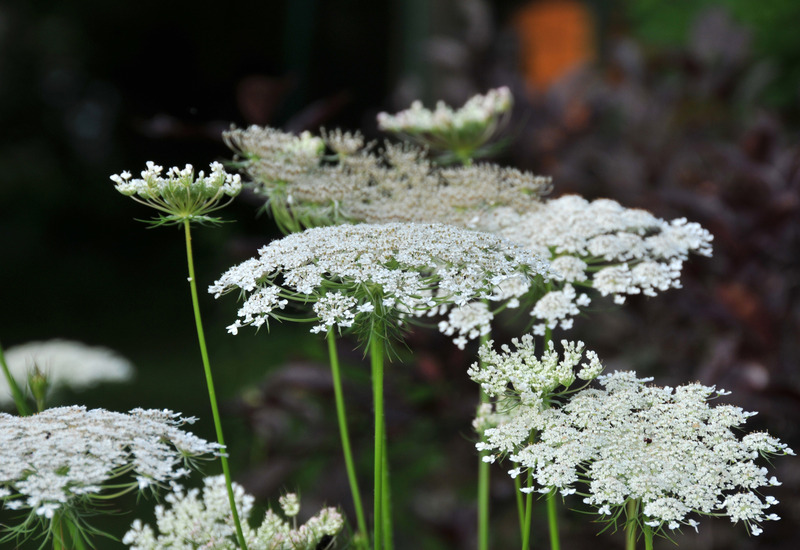 Many people regard Queen Anne’s lace (Anthriscus sylvestris) as a weed but I love them. 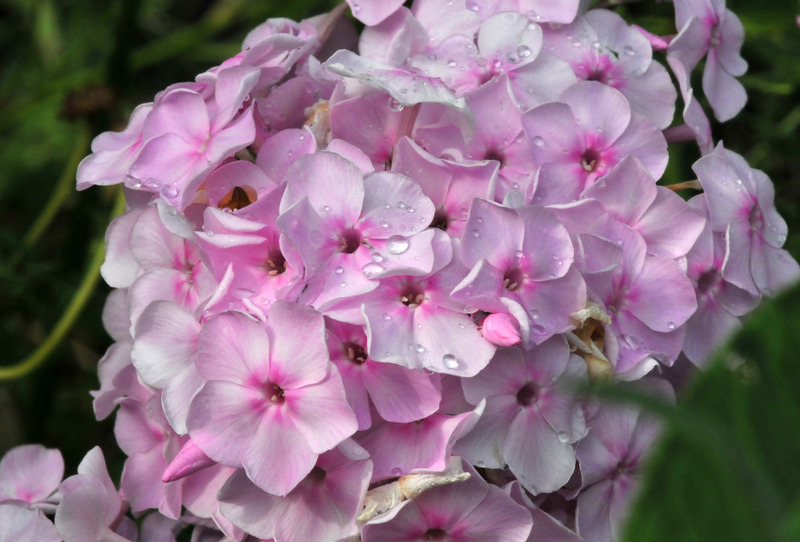 When they grow in a row or large clump, they look so beautiful and delicate. They are also great for insects and bees. 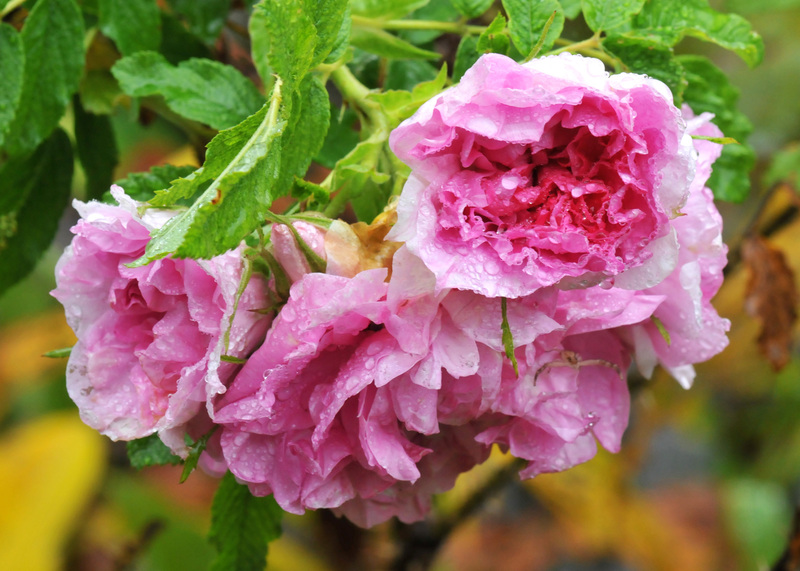 After uneven temperatures and one rainstorm after another, most of the flowers in our garden have just given up or rotted away. Only a few of them have kept blooming. As the years pass, more and more we see pounding rainfall in autumn that frequently strips the trees of what should be their proudly worn, colorful fall coat. Flowers, being the weaker stalk, fall victim first. But rather than waste words, I should let the photographs tell the story of their endurance. 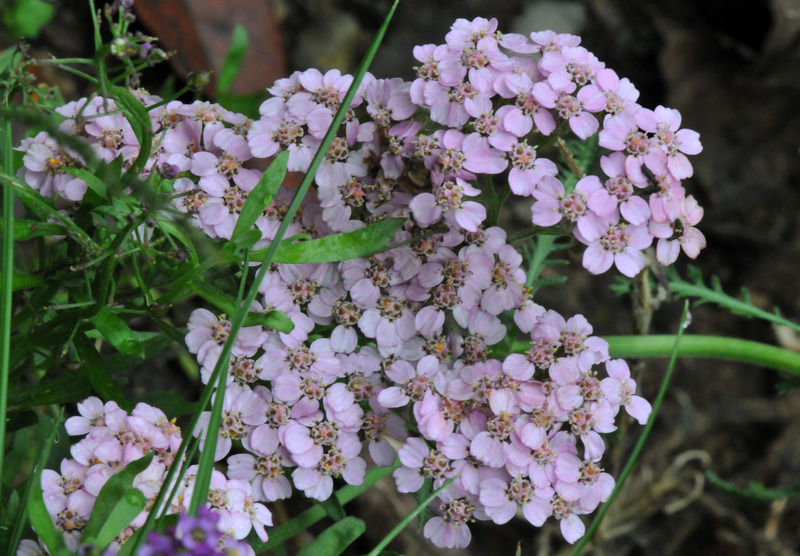 Never underestimate Alyssum. Tiny, but tough. 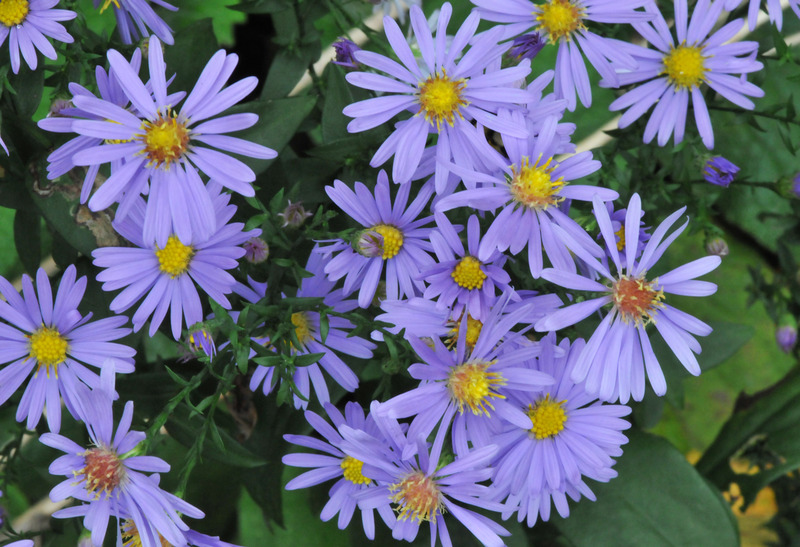 Aster, the bees have a lot to thank them for. 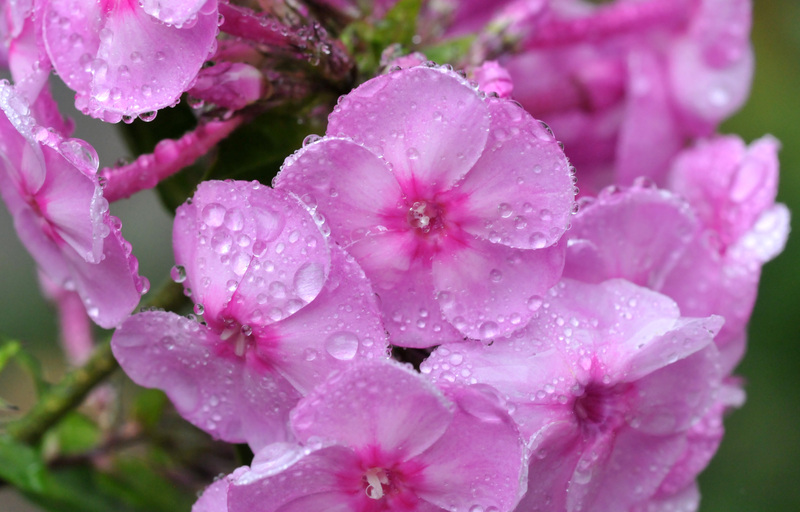 Garden Phlox-‘David’ got beat up by the rain. 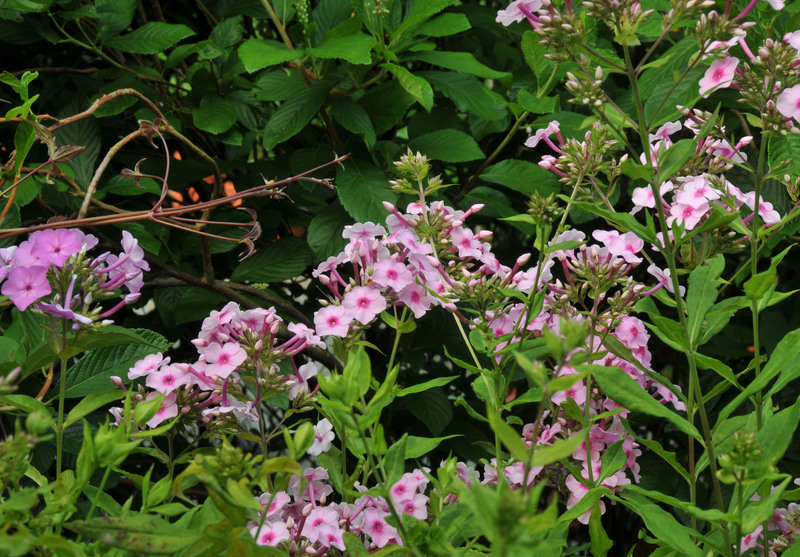 Heat and rainstorm can’t do very much damage to this native perennial. 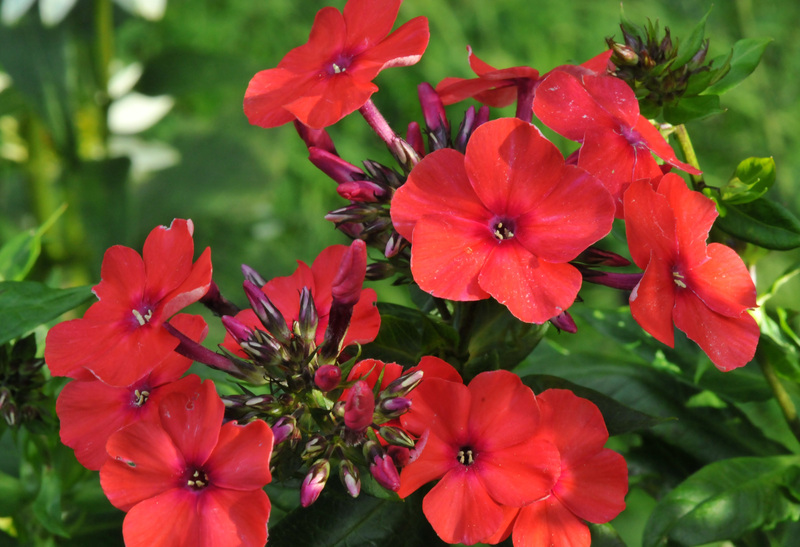 Once they’re established I merely prune them in spring so they won’t grow too tall and ‘dead-head’ them once the flower’s spent. 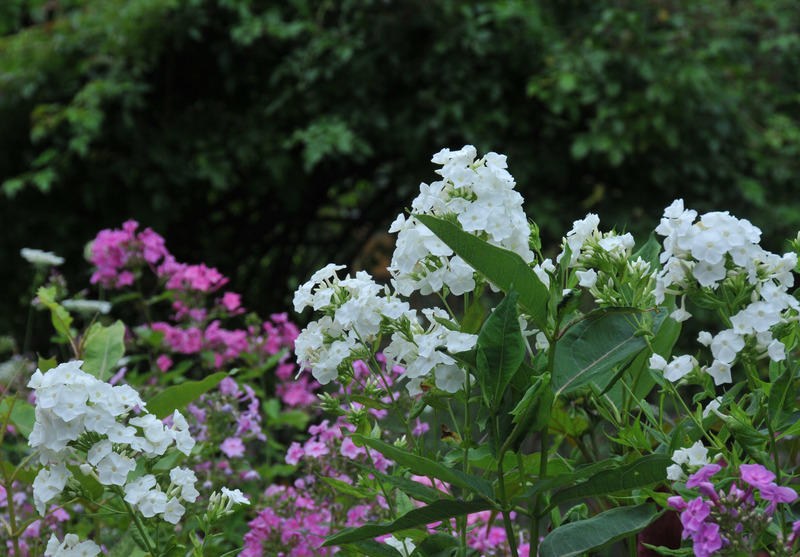 I started growing Garden Phlox (Phlox paniculata) with just a couple of them. Within a few years they proliferated all over the garden. They readily self-sow. If you don’t want too many of them, just don’t let them set seeds. My problem is I have a soft heart with seedlings. I think if it has a will to live why not let it live. 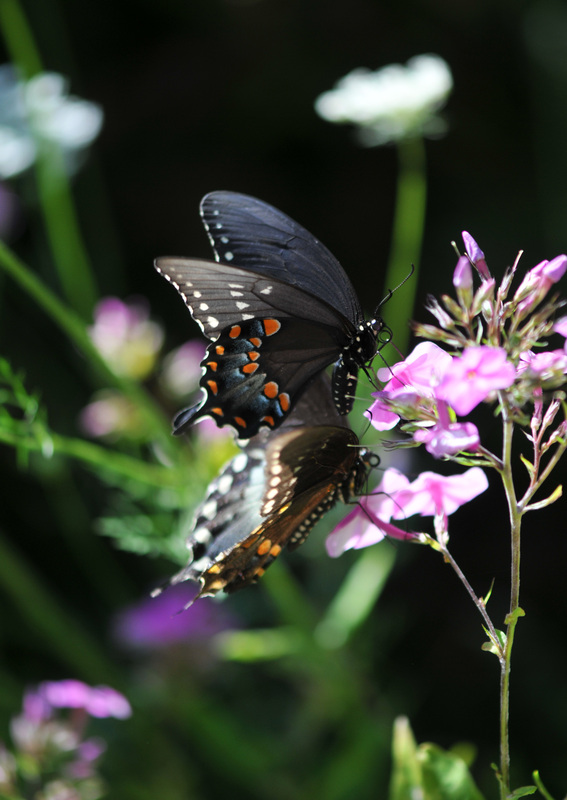 This mentality can be a problem for the garden; it can become overcrowded very quickly. So I promise myself I’ll pull out some seedlings that are still “very young”. This method works pretty well with population control and I feel less guilty too, but I probably miss a few good surprises from Mother Nature. 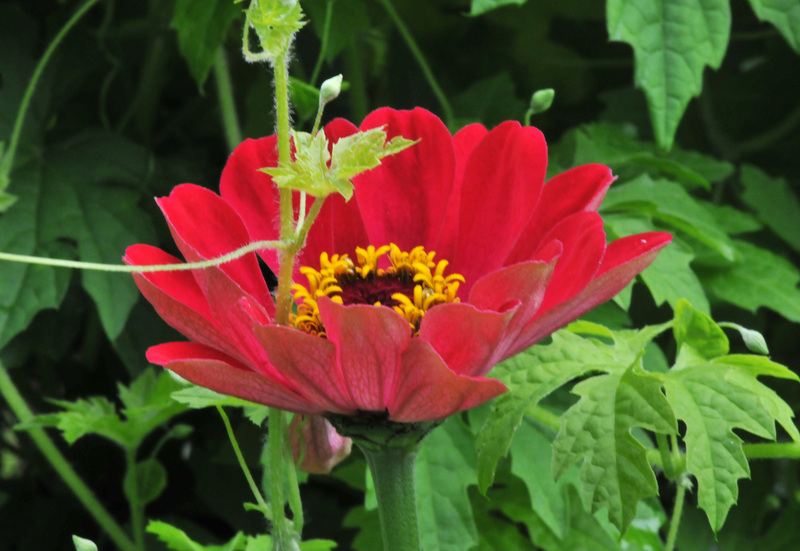 Seedlings don’t always look exactly like their parents, especially given open pollination. 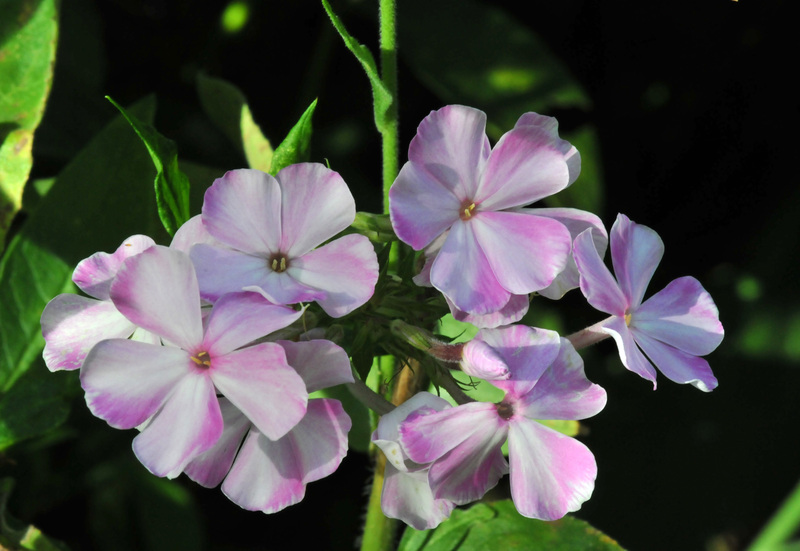 I let the Garden Phlox grow wherever they come up, if not too close to any established plants. I tag them, according to color, once they flower. Later, I either remove them if I already have too many of that color or if they have an interesting color, I move them to a better spot. If I want more of the same color, I’ll just divide them. 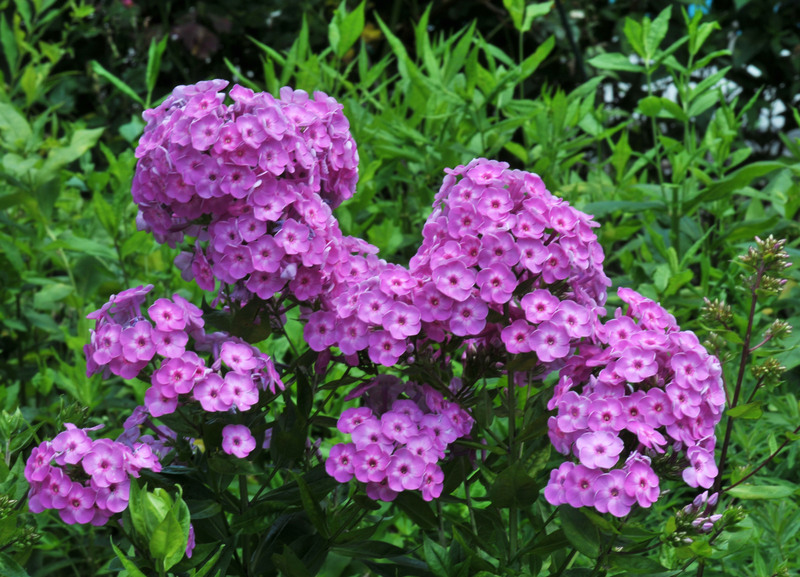 Why is Garden Phlox good to grow? Because they perform well in the heat of summer when most plants, aside from cactus, don’t. If they’re not too tall, they’ll flop a little under a rain storm but will perk right up once dry. 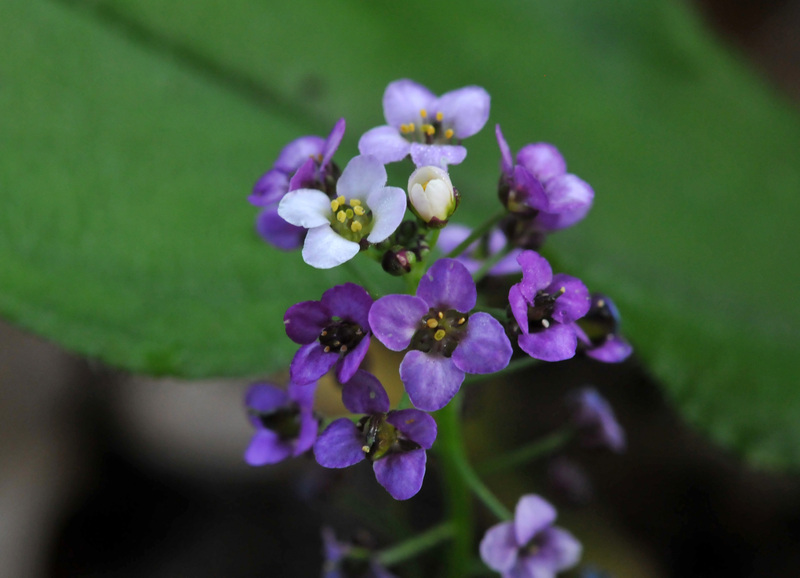 They readily self-sow, so they can be invasive, but with a little discipline in the gardener, they’re easy to control. 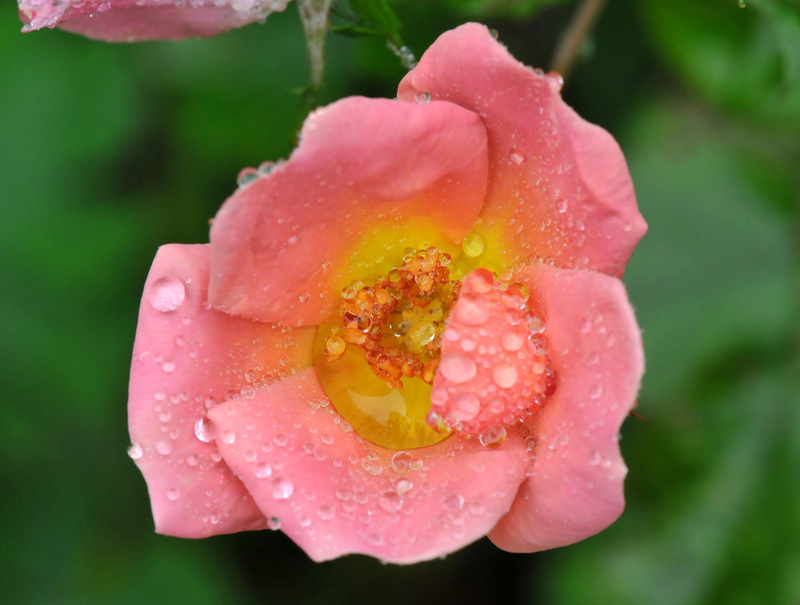 The only disease that bothers them is mildew, but if they’re dry and not too crowded mildew shouldn’t be a problem. They work beautifully as cut flowers. And, most of all, they’re fragrant. 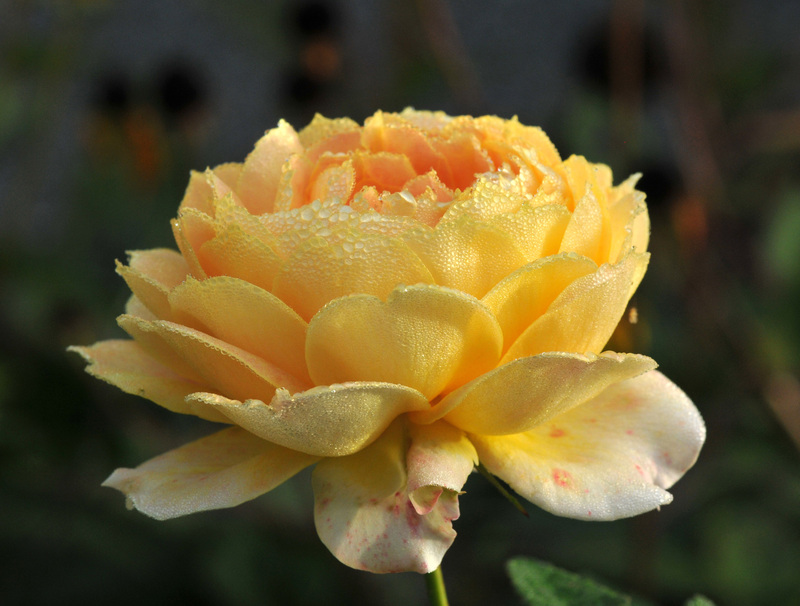 Their scent welcomes you from morning to evening. Butterflies and bees love them. Deer love them too, especially the tips. In spring I prune the row along the walkway once they grow up to my waist. This pruning makes them bushier and delays the flowering a little bit. I let the ones on the left, squeezed in with Summersweet (Clethra alnifolia), grow to their normal height (around 4 to 5 feet) to balance with other plants in the same row and to cover the pool fence. Pale pink with a darker shade around the eyelet. 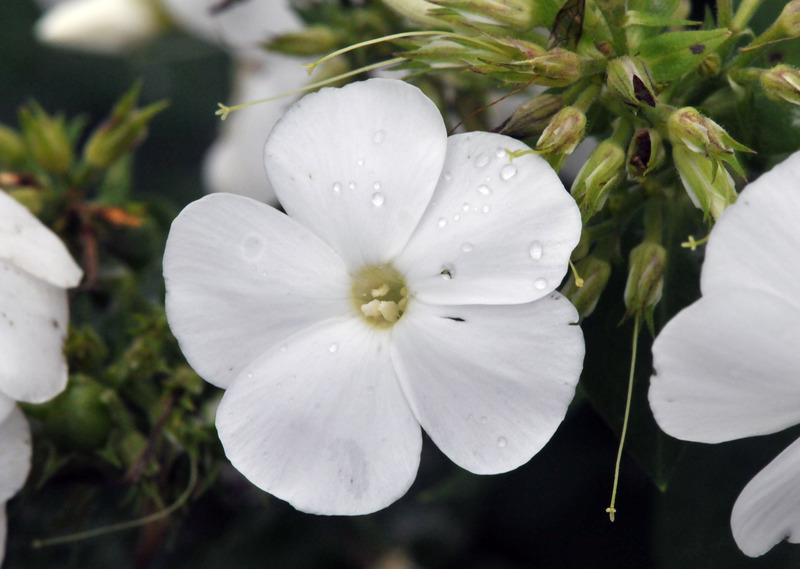 “David” produces pure white flowers. This is the only one that I know the name of. This fuchsia color first showed up two years ago and since then I have nurtured three new plants from this one. Orange-red. This one really stands out in the plot. It’s been around 90 degrees and no rain in sight. I have to water the vegetable garden daily but only once or twice a week for the rest of the garden. 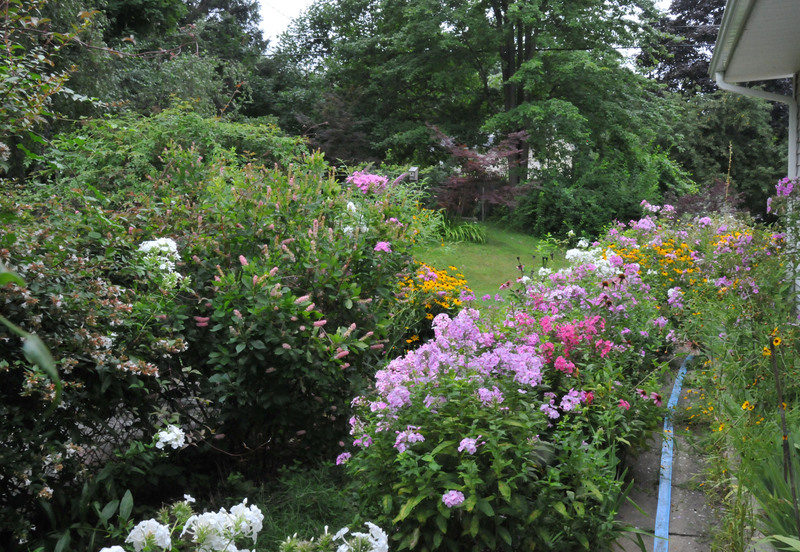 The flower plot along the driveway doesn’t get any water at all. I let mother nature take care of them. Most of them are self-sown and they weather the heat pretty well. 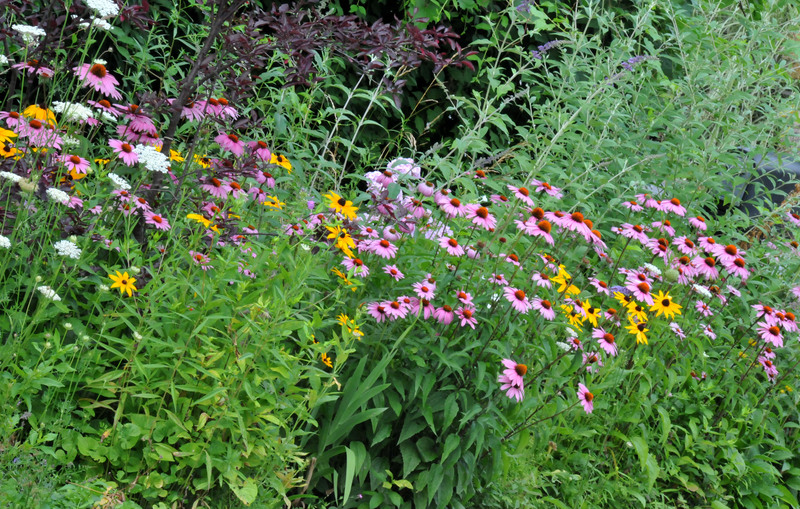 Black-eyed susan (Rudbeckia), Purple coneflower (Echinacea purpurea), Garden Phlox (Phlox paniculata), and Coreopsis don’t seem to mind the heat and drought. 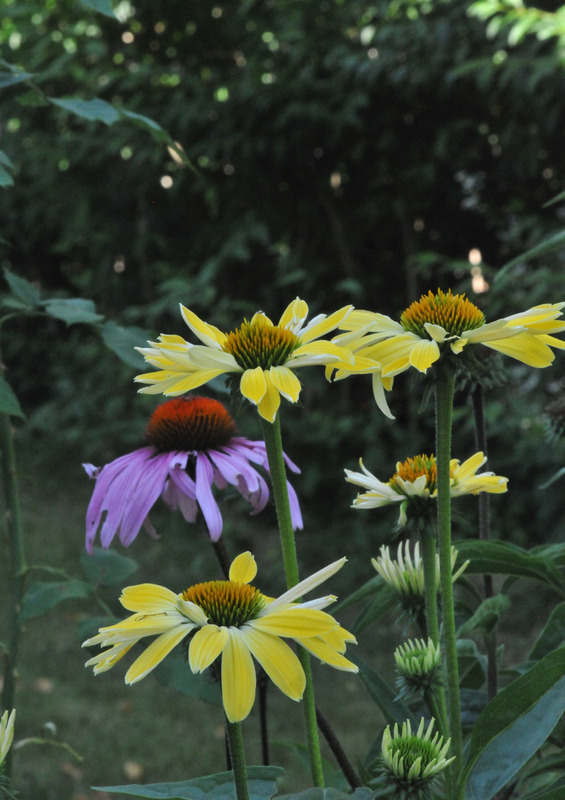 Actually, the variety of Echinacea in the garden are doing well when it’s so dry like this. No flopping and no mildewing. The only problem is they’re getting too crowded. I’ll have to weed some of them out next spring. 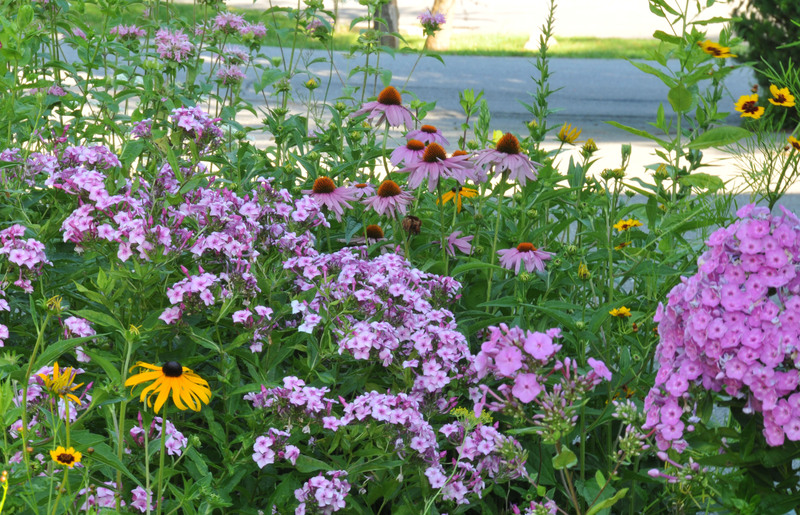 Garden Phlox, Echinacea, Coreopsis, Bee balm along the driveway. They’re all self-sown. 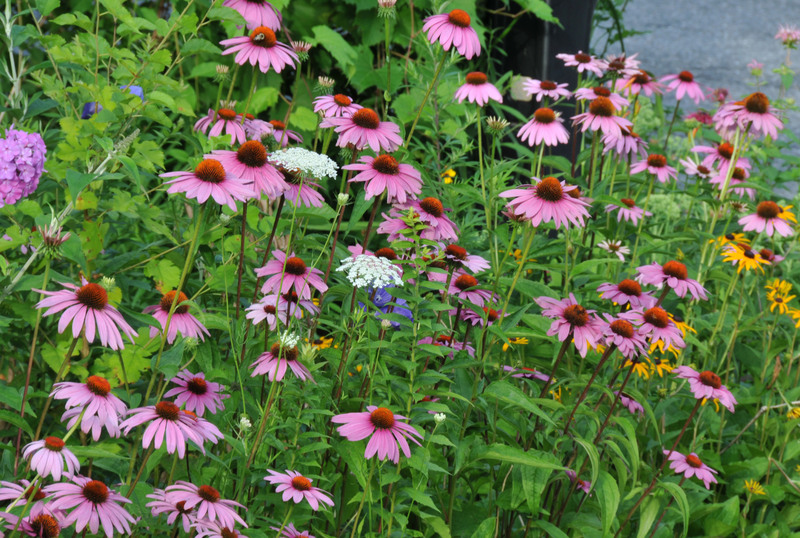 Echinacea and Rudbeckia along the driveway. 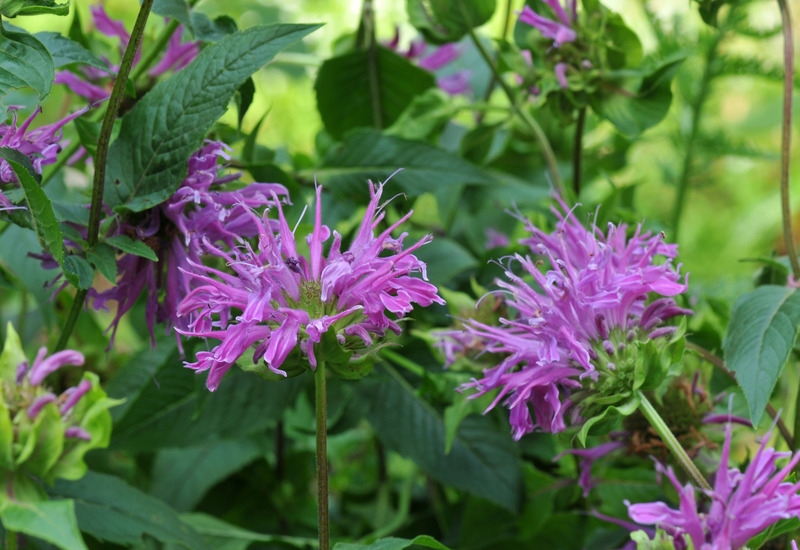 Bee balm and Rugosa rose “Mrs. Doreen Pike” still bloom under the heat. 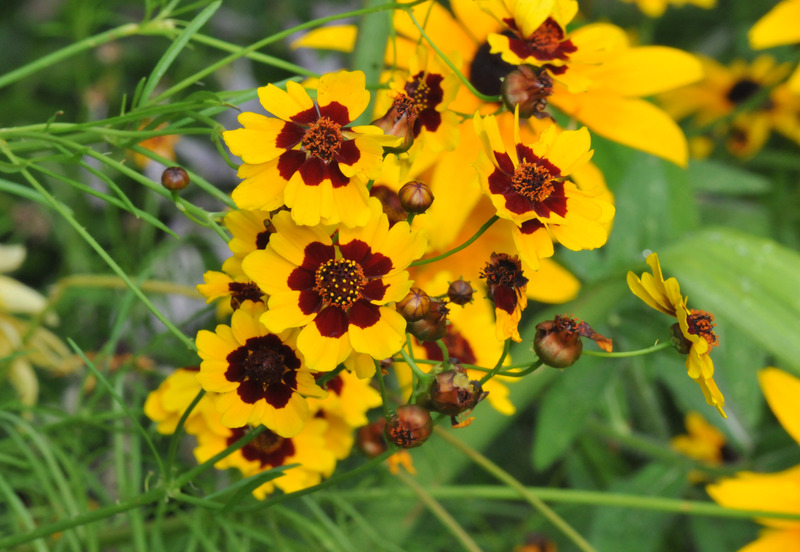 Don’t underestimate this little Coreopsis, it will grow even in a little crack in the walkway. Echinacea “Sun Rise” really stands up to the sun.